1. 'Sugarbomb' Blusher Box- £23.50- I love the look of all these boxed blushes from Benefit, but the peachy tones in this box are gorgeous! The fact they come in a box is so cool, you can't beat Benefit for packaging. 2. 'Perk Up Artist' Complete Complexion Correctors- £22.50- These concealers are made for correcting, covering and brightening which sounds like a dream where concealers are concerned to me! Again, the packaging is fantastic! 3. 'Gina Goes Glam' Fragrance Set- £29.50- This is one of the new sets brought out for the holiday season and it includes a perfume, 'Porefessional' mini and 'They're Real' mascara mini. I've been wanting to try the mascara and primer for a while so this set is great! I haven't smelt the perfume before but the cocktail shaker packaging is enough to sway it for me! 4. 'Big Beautiful Eyes' Eye Contouring Set- £24.50- The neutral eyeshadow shades in this set are perfect for everyday wear and the fact it comes with a 'Boi-ing' concealer makes it even better. 5. 'Bella Bamba' Ultra Plush Lip Gloss- £13.50- I'm really into my bright colours at the moment and this is the perfect shade. They are so glossy too (you don't say!). I have a feeling it will taste delicious too for some reason! So there you have it, my Benefit Cosmetics wishlist! 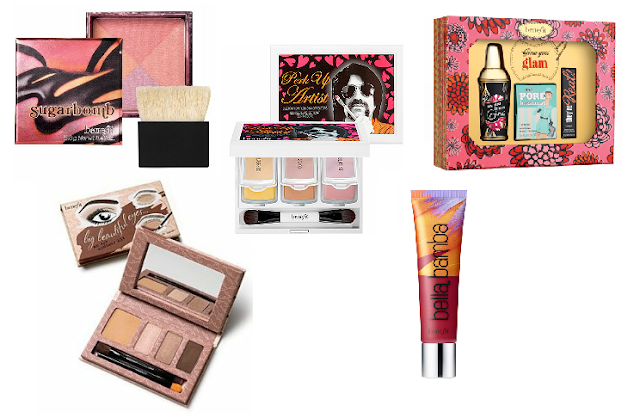 All of these products can be purchased from www.benefitcosmetics.co.uk. What do you think? What products do you love from Benefit? I love Benefit!!! Its not the cheapest brand around but they're products do tend to last a while, I've not used Sugar Bomb but I've used some of the other powders. WHat a fantastic post. Love reading anything about makeup. I want that eye palette. these are also on my wishlist, can't wait to get them!